Back in 1981, when the Czech Republic was still Czechoslovakia, the first “Furch to come” guitar was born. It was made in hiding, as the communist regime disallowed all private enterprise. Despite the danger of getting caught, František Furch could not resist his insatiable desire for all things musical and went on with doing it what he loves. Within few years František Furch’s guitars were known for their premium quality and his instruments were the choice of many top musicians. In 1989, the Velvet Revolution and the fall of communism finally allowed František to realize his dreams without fear of persecution, and he set about forming his own manufacturing company. Furch Guitars was officially founded with František Furch and one employee in a small 20m2 workshop. From that foundation day until today Furch guitars grew constantly. From being a domestic gem the word about the great sounding Czech guitar spread throughout Europe, increasing the demand for Furch guitars rapidly. In 1999, when Furch’s Millennium series was first introduced, there were already 25 luthiers working in the company. Today, the Furch company sits in a 16th century mill complex which was transformed to a guitar factory. More than 50 employees work in the factory and put their hearts and souls into each and every guitar they make. 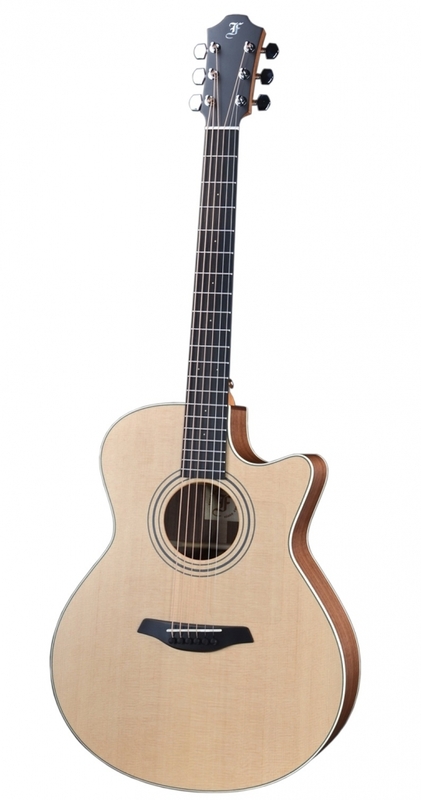 The company is run by both František and his son Petr, and they continue to produce a range of top class instruments. Furch is known for its constant experimentation with new design and construction techniques, applying modern research and technology on the quest to advance the acoustic qualities of Furch guitars. There is no question about the quality of Furch Guitars as testified by the top musicians using them; names such as Suzanne Vega, David Knopfler, Richard Smith, Glen Hansard and many more. One level up. G-22SR is the grand auditorium version of the 22 line by Furch, the first line in the Millennium series to come with a full-pore finish. 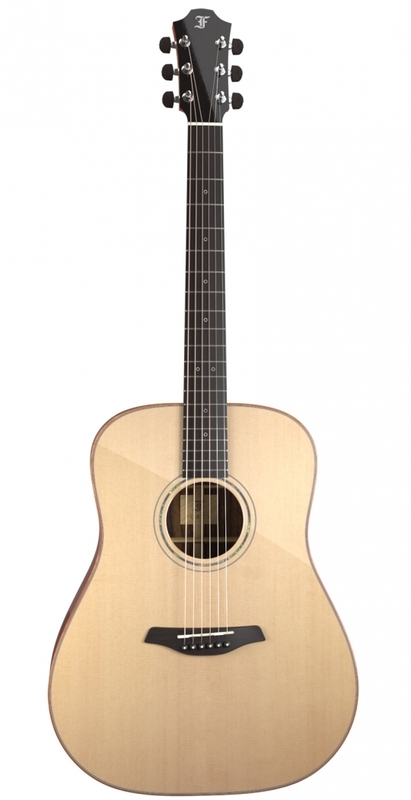 Furch's full-pore finish enhances the acoustic performance of the body, it gives more resonance to the tone. The classic combination of Sitka spruce and Indian rosewood works well, as always, but with the superb craftmenship of Furch the beloved sound of this mix gets to a whole new level.Playing the Furch G-22SR brings an immediate smile to one's face. 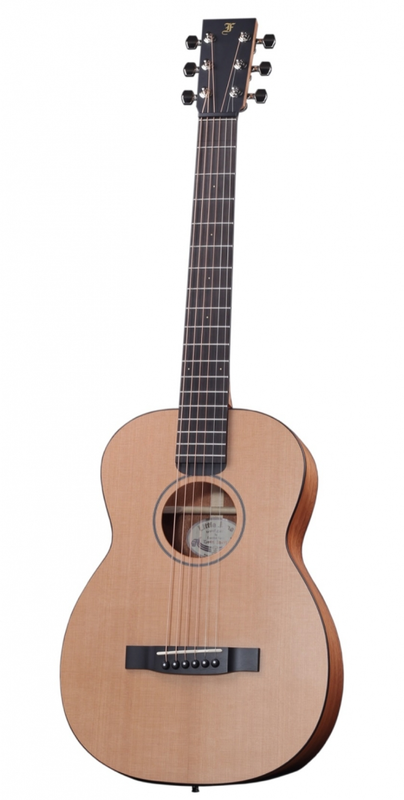 It is an excellent finger picking guitar which can also handle strumming very well. The TUSQ saddle and bridge really bring the shine out of the guitar and enhance the sustain. You are most likely to fall in love with this guitar, immediately. The D-35SR is considered as the flagship of Furch's vintage Series. 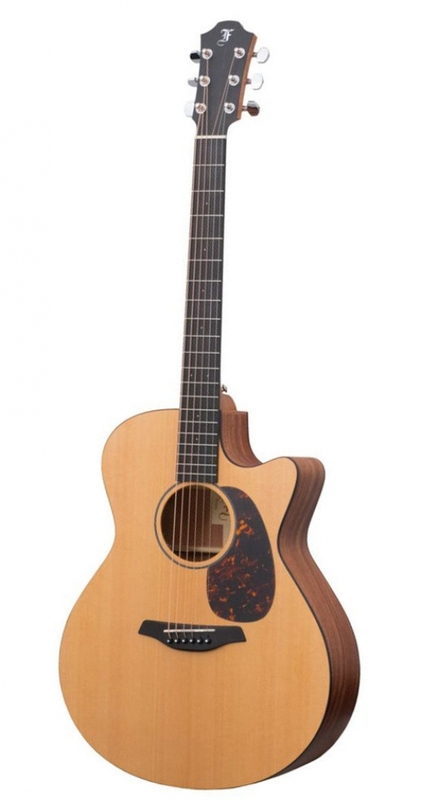 It is a well balanced, open and pure sounding guitar which is constructed from master grade woods and great attention to details.From the Madagascar Rosewood headstock veneer to the Koa binding and hand brushed finish, this guitar is a delight to look at. The Playbility is no different. The V shape neck profile is extremely comfortable, given you like V shape necks of course, and the TUSQ nut is bringing the sparkle of each string out. Sound wise the D-35SR is a warm, yet bright guitar with an healthy low end which will fill your ears with joy. It is a loud guitar, but not in a bad way as it does not distort when played hard. When played soft it is all still there and apparent.Definitely an eye and ear catcher. Minimalistic approach, maximum sound. 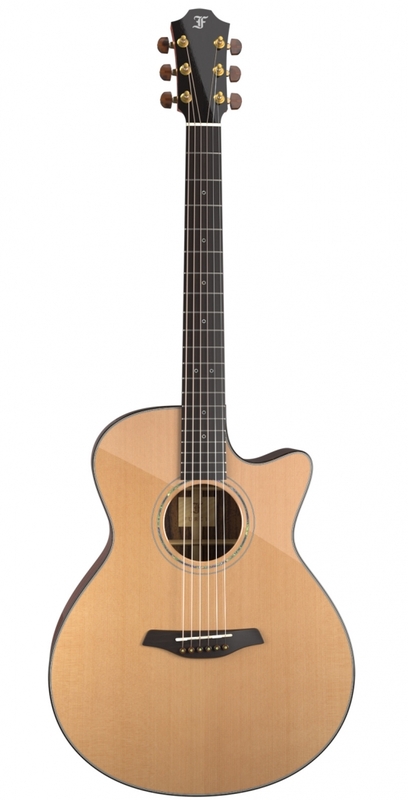 The 21 line by Furch, like the 20 line, is made with a more minimalistic approach so you could get a maximum guitar for minimum investment.The solid black walnut body in combination with the solid sitka spruce top and open pore finish give the G-21SW a natural finish both in sound and feeling.It has a dominant mid range which cuts very nice in a mix and in a loud environment like when you do street busking for instance. And the natural feeling of this guitar really makes it easy to fall in love with.It is not a fancy instrument, nor intended to be, but simply a great guitar, made of good materials and offered for an extremely competitive price. Carefully selected woods, beautiful sound. 2018 brought with it new series of guitars from the Czech manufacturer, Furch Guitars. The Green Series is one of them and the GREEN PLUS Dc SW is the Dreadnought Cutaway model with Sitka Spruce top and Black Walnut back&sides, both solid of course.What distinguishes the new Furch Series from other guitars is the unique voicing process their tops go through. We do not know how this process is being done, but the reason behind this process is to bring the tonal properties of the guitar to the highest level. In the studio we the Furch GREEN PLUS Dc SW did presented itself as a clear, balanced guitar with a nice overall projection. It had a unique combination of earthy, yet glossy tone. The new all-arounder. The combination of Red Cedar top, Indian Rosewood body and Furch's new, unique voicing process makes the YELLOW Gc CR a real nice all around guitar. It has the depth, sparkle and playability, all at the right level. We could not find anything that made us astonished, nor disappointed, it is really a perfect choice for the player that wants to have one acoustic guitar for everything.We especially liked the work on the Furch YELLOW Gc CR, the woods (all solid of course) were carefully chosen, the binding is nicely done and the overall looks of the guitar is soft on the eye. For fingerpickers, but not only. Before we even get to how it sounds, the ORANGE OM SR is one good looking guitar! Furch's wood selection, Full pore high gloss finish and new pearl round inlays make this guitar a real eye catcher.In action, the Furch ORANGE OM SR presented itself as a really easy to play guitar, perfect for fingerpicking, but not only. Although OM guitars are not the go-to strumming guitars, the Indian Rosewood and Sitka Spruce combination does bring the power out of the ORANGE OM SR and compensates the body size. The guitar does have the common OM mid range you would expect and thanks to Furch's unique voicing process the sustain on it is healthy too. Affection for detail. The Hawaiian Koa binding with white contrasting line, the Rosette of green abalone, the excellent Schaller M6 machine heads or the stylish Eclipse fingerboard inlays - there's a lot that pleases the eye. But apart from these attractive looks, the Furch Yellow Plus CR has more to offer. A balanced and warm sound performance originates from the American red cedar, the Indian Rosewood body and the mahogany neck. Moderate low mids, distinct trebles and a smooth sustain make it a pleasure to play on.Besides the Round Shouldered RS-CR, Furch offers various other body shapes available within the Yellow series. Furch goes Vintage. The VINTAGE 1 OOM is explicitly designed for the guitarist who desires a traditional look and sound in his instrument. The body is shallower and narrower in width than a classic dreadnought, consequently having less mass and feeling more intimate and making it very comfortable to play on. Its sonic characteristics could be described as mid-focussed, harmonically rich and with less low-end - brilliant especially for fingerpickers.Furch's hand-brushed finish protects the surface and accentuates the structure of the wood, with a final hand buffing leaving the Vintage 1 OOM with an attractive patina that is reminiscent for aged instruments. The Furch D-34SR is all about resonance, and a lot of it! Years of research and development brought Furch to apply a technique of advanced-tuning to the top and resonance-enhancing treatment to their finish. These additions are simply giving a new "old" life to the guitar. It feels and looks new, but sounds open as an already played guitar, at least to our ears.The D-34SR is a full range instrument with healthy low mid range and sparkling highs, comfy V shaped neck (again, if you like V shape necks) and great looks. The attention to detail is immaculate, from the wood to the gold tuning machines.Everything about this guitar says quality. The Clapton style. The Furch OM-32SM immediately makes us play some Clapton..It's dry, well balanced and thanks to the Honduras Mahogany has straight forward lows which supports your thumb playing nicely.Not to say that it cannot be strummed, but it is, to us, more of a finger picking/hybrid kind of guitar.Design wise, it is simple and beautiful, which fits the natural sound that fills the room once played, the vintage hand brushed finish is smooth and nicely done. From top to bottom, the Furch D25-CR is truly a remarkable instrument. 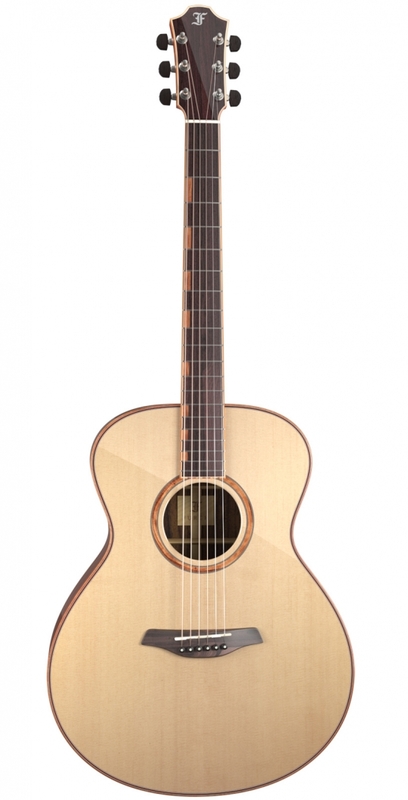 First look at the Furch D25-CR reveals sheer beauty. The flawless, meticulous work which is put into this guitar is visible no matter where you look.The carefully chosen master grade Red Cedar top and Indian Rosewood back and sides, the lovely Hawaiian Koa binding, the delicate abalone purfling work and well decorated headstock are just a delight to look at.It's not that other brands do not offer such high end guitars, it's just that usually a guitar in this grade can easily cost north of 4000$, which is not the case with the Furch D25-CR.From the first chord, the resonance of the woods is very evident, the guitar has an extremely long sustain, vibrant overtones, lively tone which makes you wanna play slow so you can enjoy every note to it's fullest.The Furch D25-CR is beautifully balanced with a tiny bit of mid range strength which comes very handy when playing finger-style or arpeggios.Top that with the L.R. Baggs Anthem system and you get a premium instrument.At the top of Furch's Millennium series sits the Furch D25-CR, it's not a wonder why, one note and you will understand. From a bag to a guitar. The facts that it passes every airline cabin luggage limitation and sounds absolutely wonderful make the Little Jane (LJ10) by Furch probably the best travel guitar you have ever encountered so far.The Little Jane is by all means a high class travel guitar. Priced at around 1000$, it may be more expensive than most other travel guitars, but the solid woods which it is built from, the perfect playability and smart construction make it a bang for the buck!First noticable thing is, that as soon as you assemble it, it is in tune. That is simply great. 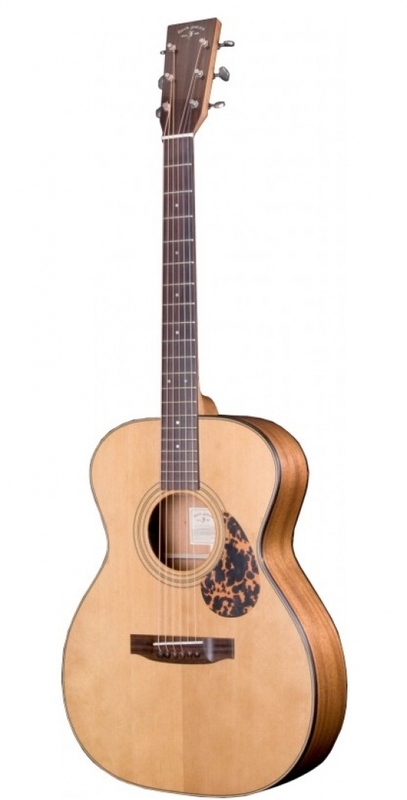 Second thing is, that even though it has a short scale, there is little to no string buzz while the action is actually comfortable to play.If you are of the kind that like to take their guitar everywhere but do not compromise on your tone, the Furch Little Jane may very well be your best companion ever. Great value for money. If you ask some owners of the G-23CR for their opinion they will most likely say that this guitar is "one of the best value for money guitars out there". We agree.It is a loud, resonant, full bodied grand auditorium guitar that which is beautifully made.The 23 line sits a bit above the mid level of the Millennium series and is the first to offer custom options like exotic woods and so on.We however, simply love the default features on it. the Rosewood/Cedar combination gives it a warm and mellow sound yet loud, the flower inlays and high gloss finish give it this stylish looks...what is there not to love. Warm woody tone. 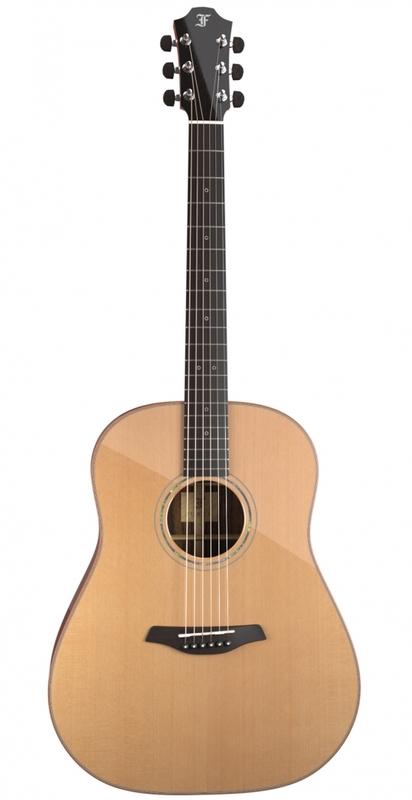 The Furch OM-20-CM Natural is an orchestra model acoustic guitar. It features a solid Canadian cedar top, back and sides consist of solid mahogany and the neck is made from mahogany as well. 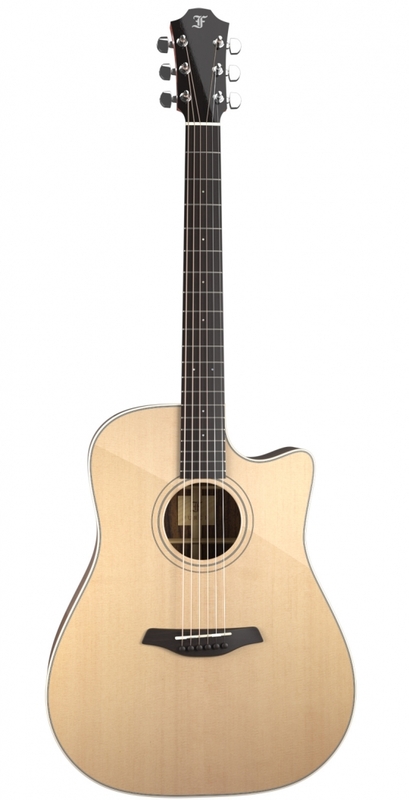 It is a fantastic guitar which priced well. The natural finish gives it a warm woody tone and although it is a small body guitar it projects a good amount of sound. For the fingerpicker. 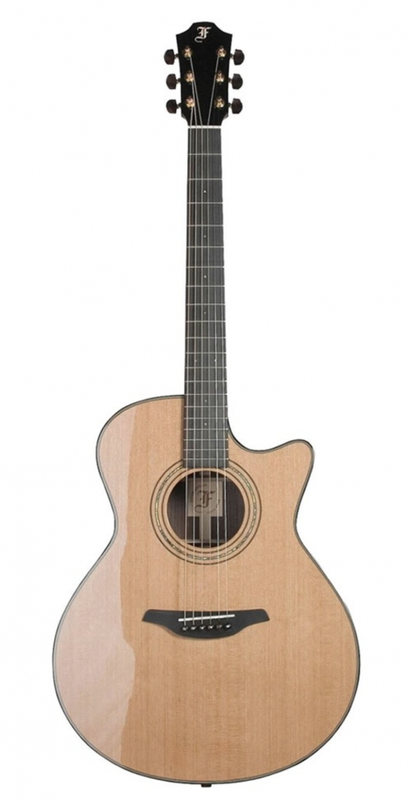 The Furch OM23-CR is a guitar for the fingerpicker who seeks for a more contemporary sound. It's got sustain, resonance, round tone and is surprisingly loud which makes it a good pick for ensemble use.Playing it, you will notice the healthy mid range frequencies it projects. This, along with Furch's bracing method, brings out of the OM23-CR prominent harmonies even when played softly. The 23 line sits a bit above the mid level of the Millennium series and is the first to offer custom options like exotic woods and so on. We however, simply love the default features on it. the Rosewood/Cedar combination works well, the flower inlays and high gloss finish give it this stylish looks...what is there not to love. If you like tight and dry tone then this is the guitar for you. On most of the vintage series Furch applies a hand-brushed vintage finish which in our opinion has got a lot to do with the sound of the OM31-SR. When playing it, the guitar feels very tight, tight is a main word for describing this instrument. Every note is there, right on the spot, but more solid or should we say "raw" than what you get when playing standard finished guitars. To us, the OM31-SR feels like a great candidate for the solo singer songwriter who likes it real. Quite simply â a nice Dreadnought. Furch's VIOLET Series is one of two guitar lines that feature a combination of solid and layered woods, hereby enabling Furch to offer this high-grade acoustic guitar at less than 800â¬. The beautiful Sitka Spruce soundboard is tuned by Furch's unique voicing process to enhance the guitar's tonal properties, making it a strong, loud, yet still dynamic instrument. The playability is smooth and the balanced sound let's the player easily switch between styles.The VIOLET SY is getting by without eye-catching details, but rather focussing on being a well sounding instrument that deserves bearing the Furch Logo. What a powerful dreadnought. The Furch INDIGO series features semi-solid wood guitars priced from just over 850â¬. 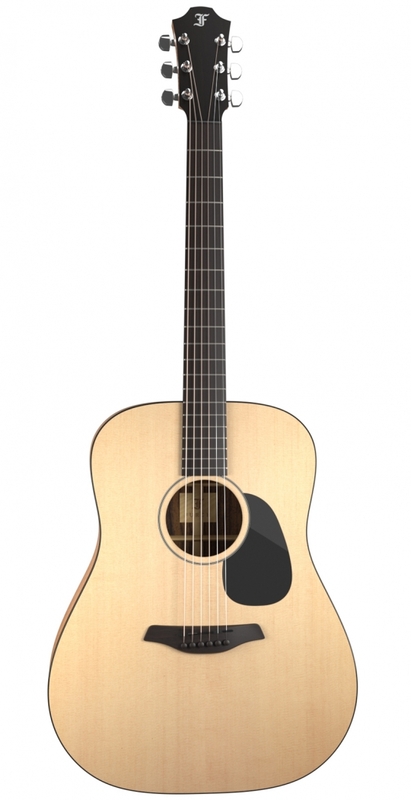 This particular Furch dreadnought sounds a lot like it looks - bright and classy. The combination of American Red Cedar, layered Mahogany and an Ebony fretboard results in an exciting, powerful tone that seems ready for nearly any playing style. For an improved resonance the back of the Furch INDIGO CY got pressed into an arch to make the reinforcing braces redundant.Furch withdrew from unnecessary add-ons and was hereby able to craft a quality guitar to an absolute fair price. The BLUE series is Furchâs entry level for all solid guitars. A balanced tone that inspires. Slighty pronounced lows, clear mids and a bright top-end. Ideal for finger style and dynamic playing. Furch developed a unique voicing process. Hereby, the soundboard is tuned for enhancing the guitarâs tonal properties to the highest level. A delicate binding and an open-pore finish contribute to the elegant looks. The Furch BLUE Gc-SW is all in all a sweet guitar with excellent playability and fine craftsmanship. Small and neat... 2018 brought with it new series of guitars from the Czech manufacturer, Furch Guitars. The GREEN Series is one of them and the GREEN PLUS OMc-SR is the Orchestra Model Cutaway model with Sitka Spruce top and Indian Rosewood back&sides, both solid of course.OM acoustic guitars with a cutaway are not super common, as a fingerpicking purist, the OM models usually kept in the traditional no-cut design. We love cutaways, why not having those extra frets up the scale easily reachable? !The GREEN Plus OMc-SR is an open sounding guitar, it is not booming, nor does it have strong bass. It is more of a mid-to-high range guitar, which can fit well to a deep sounding male voice, solo guitarists and hybrid pickers as it has good attack and leaves space for other instruments. Clean looks meets healthy tone. The YELLOW SERIES by Furch is by all means a great one. While it is not their top series, it still uses all the "must haves" - Solid woods, attention to detail, fine craftsmanship and great tone. The D-SR that came in for demos had a nicely figured Indian Rosewood body and sound wise was deep and loud. It is a great strumming guitar that blends in well in band context. If you tend to finger pick a lot we recommend checking the YELLOW G or Gc models. Responsive... Really, if we need to describe the Furch ORANGE Plus D-CR in one word, it would be "Responsive". The combination of solid Cedar top and solid Indian Rosewood body normally yields to a somewhat darker sounding guitar with a healthy low mid range. 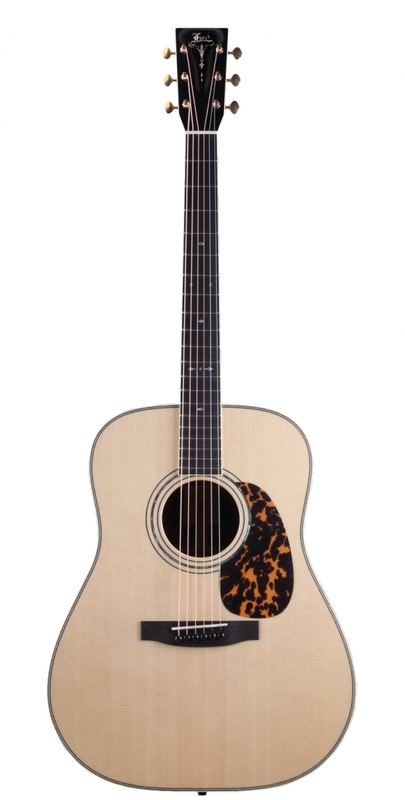 While the ORANGE D-CR does have a nice low end, it is definitely not a dark sounding acoustic guitar. It is responsive, lively and has a beautiful mid range. Pick players should really check this guitar out, the attack of the pick blends nicely in the overall sound and even the slightest articulation is noticed.Furch coat the ORANGE Series guitars with high gloss finish which protects the woods yet let the guitar breath and age, the ORANGE Plus D-CR is indeed a good looking guitar with a very natural feel and sustain. Top of the line! With the Red-SR the guys at Furch present the best of their craftsmanship. 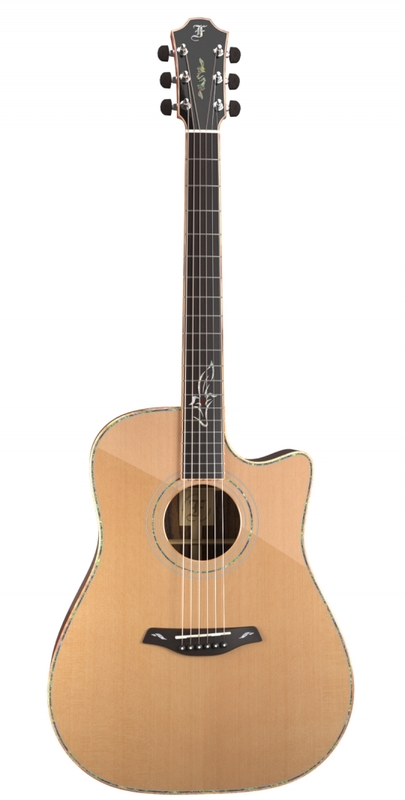 The combination of extraordinary tonewoods, a special voicing process that tunes soundboard and backplate and a high precision dual-action truss rod make this guitar stand out.The ultrathin layer of full-pore high-gloss finish protects the guitar and enhances the tonal qualities delievered mostly by the outstanding alliance of sitka spruce and indian rosewood.Besides the OMc (Orchestra Model Cutaway) there's numerous variations in the shape while all of them offer a beautifully balanced sound, clear & dynamic.The Furch Red-SR leaves nothing to be desired. Furchâs top of the line guitars do not disappoint! 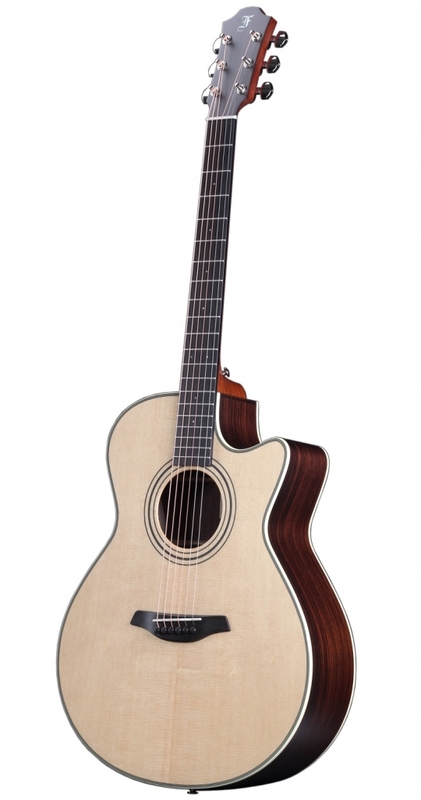 The RED SERIES by Furch Guitars is built using premium solid Sitka Spruce and Indian Rosewood woods. The work on the guitars is meticulous, and the unique voicing process these guitars go through really balances the tone. The G model, which stands for Grand Auditorium, is a perfect all around model. You will enjoy the openness of the guitar while you wonât lack any lows. In our opinion, the RED Plus G-SR is a great guitar for stage musicians who care both about sound and looks.